It took a review by a ten-year old boy to convince a publisher to print it, but on September 21, 1937, the first edition of The Hobbit hit the bookstores. These first 1500 copies would mark the beginning of the one most successful novels of the 20th century. The story of Bilbo Baggins is now celebrating its 75th anniversary, and with as many as hundred million copies already sold The Hobbit is still going strong. A two-part film based on the novel is about to come out, with the first part The Hobbit: The Desolation of Smaug, being released in December. The new attention will probably ensure further generations of new readers. Bilbo Baggins was a Hobbit who lived in his Hobbit hole and never went for adventures, at last Gandalf the wizard and his Dwarves persuaded him to go. He had a very exciting time fighting goblins and wargs. At last they get to the lonely mountain; Smaug, the dragon who guards it is killed and after a terrific battle with the goblins he returned home — rich! This book, with the help of maps, does not need any illustrations it is good and should appeal to all children between the ages of 5 and 9. 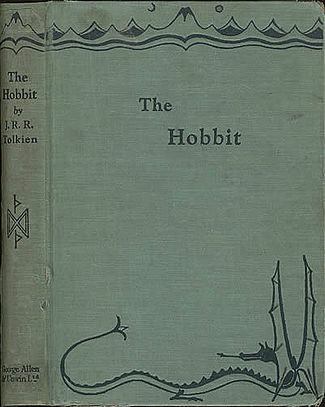 The Hobbit quickly sold out of its first 1500 copies, and it remained a popular book over the next several years. However, it was not until J.R.R. Tolkien’s sequel, The Lord of the Rings, was published in 1954-55 that work became an international bestseller.